The Opal card is an easy, convenient way of paying for your travel on public transport in Sydney, Newcastle, Wollongong and surrounding areas. Opal has now been implemented for Sydney Light Rail, many buses, Sydney and Newcastle Ferries, all Sydney Trains and NSW TrainLink Intercity trains in the yellow shaded Opal region on the map above. With an Opal card you can enjoy travel all day for no more than $15 per day for Adults. You can order an Opal Card online, and it will be mailed to you. If you want to start using your Opal card right away there is also the option to pick up an unregistered Opal card from more than 1,500 retailers. Myki is your ticket to travel on Melbourne's trains, trams and buses, V/Line commuter train services and buses in Seymour, Ballarat, Bendigo, Geelong, the Latrobe Valley and Warragul in the yellow shaded Myki region on the map above. Go card is TransLink's South East Queensland electronic ticket. It allows you to travel seamlessly on all TransLink bus, train, ferry and tram services in the Go card yellow shaded region on the map above. Visitors to South East Queensland can use go card to easily explore the region. Metrocard is the most convenient way to travel on Adelaide trains, trams and buses in the Metrocard yellow shaded region on the map above. Metrocard is easy to buy, use and recharge. You can buy Metrocards at ticket vending machines and Metrocard agents around Adelaide. There is a small cost to buy a metrocard. Your card is then reusable and yours to look after. Metrocards are not refundable. When you buy your metrocard you will need to add a starting balance of $5. 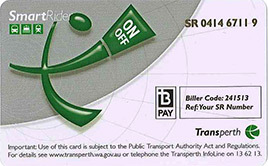 SmartRider is a reusable smart card, which allows easy, hassle free travel on Transperth train and bus services in the SmartRider yellow shaded region on the map above. SmartRider gives you a discount of 15%-25% off standard fares. Buy your SmartRider card for $10 at any of the 4 TransPerth Information Centres or at one of 60 Retail outlets across the Perth suburban area. Simply 'tag on' when you board your bus or enter the railway station, and 'tag off' when you get off the bus or leave the station.